Today, health practitioners face challenges and opportunities that are growing increasingly complex and involve diverse stakeholders. In order to realize the creativity necessary for true innovation and change in the fields of health sciences, it is essential for global leaders to acquire new problem solving methods and research perspectives. As design thinking is a human-centered approach focused on crafting real world applications, it is an ideal method for bridging clinical or health care realities with basic science or lab research. The design-thinking model is centered on open-ended and creative data collection, solution prototyping and testing, and iteration based on feedback through all parts of the research and production process. 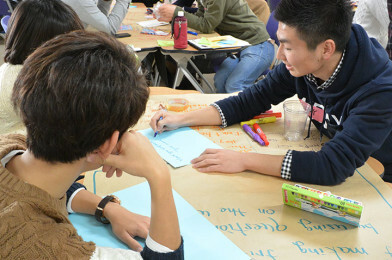 Students in this workshop will work through several challenges in order to increase their knowledge of the design thinking toolkit as well as learn brainstorming and other creative thinking methods.